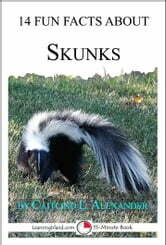 You know they are one of the stinkiest animals on the planet, but what else do you know about skunks? Here are some more things you might not know. Can a skunk aim its spray? How well do skunks see? What happens to a skunk when the weather turns cold? How far away can you smell a skunk spray? Learn the answer to these questions and many more in this 15-Minute Book. Skunks are insect eating mammals with a spray that can send you running, but some things about them might surprise you. How much do you know about skunks? Kids! Are You Kidding Me!